The following newspaper article appeared in the Norwich Bulletin on July 19, 1910. Triplanes Constructed by Messrs Stebbins and Gaynet Will Be Tried Out In October – Practically Completed Now – Will Lift, It Is Estimated, 1,200 Pounds having 25-30 Horse Power Motor – Built at Sachem Park In The Past Three Months. The people of this city and the public in general who go to Sachem Park today will have an opportunity to see an aeroplane, the first practical flying machine to be brought to completion in Norwich. In a little shed just north of St. Mary’s Cemetery this bird of the air stands with its snow wings poised ready for flight at the word of its creators. 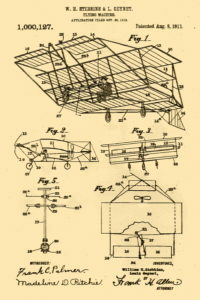 Back in 1908, William H. Stebbins and Louis Geynet began to have visions of flying through the air. They began to study the science of aeronautics, they worked out theories , and finally they evolved a tiny model aeroplane, the forerunner of the full-grown machine they have today at their workshop at the park. These young men, who are well known in Norwich and are both of a mechanical bent and inventive turn of mind, attended the big airship shows in Boston and New York, inspected to the minutest details their workings, watched the aviators at their flights, and finally in February of this year, they set up a workshop where they might build a machine of their own. In spite of the difficulty and expense of procuring the materials, and other obstacles that came up in their way in April, Messrs Geynet and Stebbins were ready to start. Working themselves at every opportunity and employing several assistants during the large part of the succeeding three months , the men who are to essay that most difficult art, aviation, now have every rib in place, every cable taut, and as far as the machine itself is concerned are ready for flight today. It is a rough country, however, about Sachem Park, for airship flights, and the chances of mishap in case of an enforced descent are too numerous to be risked. So Messrs Stebbins and Geynet are to have a special aeroplane tent made, and with this portable house they will be able to move to any suitable aviation grounds they may decide upon. The tent will not be received before a month and as some preliminary ground trials are necessary to enable the aviators to learn how to control and manage their craft, Messrs Stebbins and Geynet state they do not expect to attempt a flight before October 1. In building their aeroplane, the Norwich men made a departure from the usual design, making their machine a triplane, instead of the biplane or monoplane type, that is to say it has three planes, one above the other, for the supporting surface in the air instead of the customary two or one. The aeroplane’s spread, or its total width, is 24 feet. The planes lap over each other , the topmost being 24 feet long by 7 feet wide, the middle 20 feet by 6 feet, and the undermost 16 by 5. The planes are ribbed, with two-piece, laminated ribs of Oregon spruce, covered with special aeroplane fine-woven varnished linen fabric, air and moisture proof. The planes are somwwhat curved upward to better catch the air. Aluminum joints are used wherever possible to secure additional lightness and the machine is strongly braced and trussed with special galvanized twisted aeroplane cable, which has a breaking strength of 500 pounds to the inch. The motive power will be furnished by a 25-30 horsepower Cameron aviation motor, weighing 200 pounds, seated upon a maple frame. The seat for the operator is located just in front of the engine. The steering apparatus is known as the auto-control, and is not far different from the steering gear of the automobile. The balancing and elevating device in the front is worked by a steering wheel, while the tail ruder is controlled by a foot, the steering planes being so adjusted as to keep the craft stable and on an even keel. Three sizes of propellers will be owned by Messrs Geynet and Stebbins: six, seven, and 7 1/2 feet. The motor turns up about 200 pounds thrust and 1,200 revolutions per minute, which will send the craft along at the speed of an express train. The three planes provide a lifting area of 400 square feet, which should lift about 1,200 pounds, the designers figure from what other planes have done. The whole machine, without the operator, weighs 650 pounds. The balance of lifting power, 550 pounds, therefore should provide for the operator, a passenger, gasoline, and other supplies, and still the craft should be within carrying capacity. The aeroplane is of a height that will permit it to be rolled out of the one-story workshop, built expressly for the machine with swinging doors, and fully equipped with electric motor, machinery and tools. Three pneumatic tired wheels support the machine. There is also a skid with springs on the underside which will break the force of the landing in a descent, and in case of a wheel being broken, protect the plane. There have been many visitors at the aviation workshop of Messrs Stebbins and Geynet, and all who have seen the product of their time, brains and money, praise it highly, especially cheering to the designers being the encouragement given them by a Hartford aviator who recently saw their machine. He commended their energy and enterprise and saw no reason why they should not be successful in the air. Their plans have been long considered and carefully laid, and Stebbins and Geynet, aviators, are deserving of success. The following newspaper article appeared in the Norwich Bulletin on August 30, 1910. Builders of Triplane Will Make Another Try With Present Engine After New Tires Are Received. Four big aeroplane propellers designed by Stebbins and Geynet of this city, and built under their supervision at their shop at Sachem Park, are displayed in Preston Bros. window. The heavy wooden blades that will drive through the air the first aeroplane built in Norwich and the first triplane in America, attract much attention from passersby. All of the propellers are laminated, the first being walnut and mahogany of the Wright type, with a 52 inch pitch. The second is of mahogany and ash, of the Curtis type, with a 6 foot pitch. The other two are mahogany and walnut of the Chauviere (Paris) type, and of 4 feet pitch. They are true screw propellers. Stebbins and Geynet have not yet used their latest and largest propeller and they plan to give it a trail shortly with their present engine. If the new propeller gives them sufficient thrust, they believe that the purchase of a new motor may not be necessary. At the present time they are waiting for pneumatic tired wheels, these parts of the machine having been damaged in their recent ground trial at Sachem Park. The wheels are expected here from Hartford at any time. The big aeroplane tent has been completed for some time so that Stebbins and Geynet will be all ready for their exhibition next week. The following newspaper article appeared in the Norwich Bulletin on September 9, 1910. Stebbins and Geynet have sold this week the 30 horsepower Cameron engine which they had on exhibition with their aeroplane at the fair grounds. They shipped it to the purchaser in Pennsylvania on Thursday evening. This morning about 12:30 o’clock they passed through Franklin Square with their aeroplane on the way from the fair grounds to Sachem Park, where they built and keep the machine. This morning they expect to leave to attend the aviation meeting at Boston, where they will decide on a new motor, to be of 50 horsepower. They do not expect to have the aeroplane ready for flight until late in the fall or early spring largely due to the time, thirty to sixty days, required for the shipment of first class motors. There was a gratifying interest shown in their machine at the fair and their exhibition was a success.